Dedicated FPV cameras provides low latency real-time video to the drone pilots when they are flying. To choose the best FPV camera for racing drones and multirotors in general, there are a few things to consider which we will discuss in this tutorial. FPV camera is one of the most important parts of the FPV setup on a quadcopter. Real-time video captured from FPV camera is sent to the pilot through a video transmitter. It doesn’t matter what video transmitter you are going to use, the image you see is only as good as your FPV camera. I compiled the specifications of all FPV cameras for mini quad in this spreadsheet so you can compare them more closely. If you are looking for recommendations, here is my take on the best FPV cameras. Can I use HD Camera as FPV Camera? 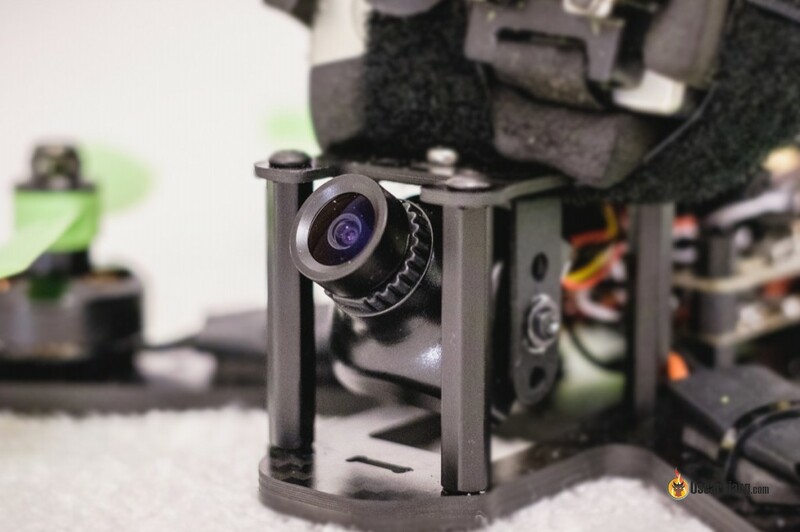 The size and shape of FPV cameras determine how easily the camera can be mounted in a given multirotor frame. Here is a little bit of history how FPV camera evolved over the years. 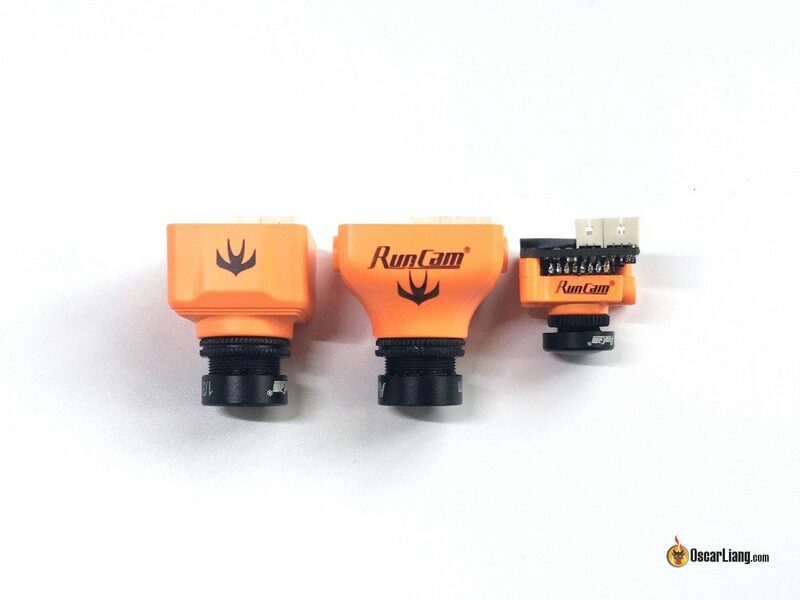 Runcam is probably one of the earliest companies who specialized in FPV cameras. They used to make surveillance cameras, but more and more people started using CCTV cameras for FPV so Runcam slowly turned to FPV. Back in 2013 and 2014, the Runcam PZ0420 CCD camera was made popular for FPV. It’s such an iconic camera because it was the absolute best camera at the time (mainly because there weren’t many other options around). It’s built on a square 32x32mm PCB without any protection and they are normally referred to as “board cameras”. Components in a board camera are completely exposed and can get damaged easily in a crash. 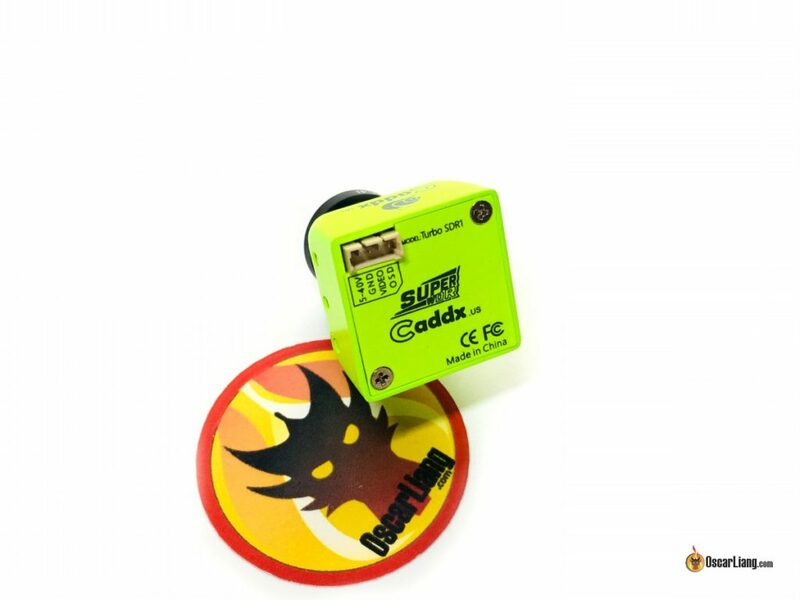 In 2014, Runcam released one of the very first cameras designed specifically for FPV with protective enclosure – the Runcam Sky. It started the trend of putting cameras in a protective case. FPV camera dimension didn’t settled until Foxeer released their iconic HS1177 later that year. It’s a 28x28mm camera (height and width), and that became the standard for the next few years. Nearly all the mini quad frames after that were designed to support this camera size. In 2016 and 2017, Runcam developed even smaller and lighter cameras, the Swift Mini (21mm wide), and the Swift Micro (19mm). And these two sizes are now part of the standard. A dedicated FPV camera can weigh between 4g to 20g. There are also “AIO” (all in one) FPV cameras that has a video transmitter integrated (usually mounted on the back). They have a small form factor and light weight, however they are usually not the best in terms of image quality and range. These are popular in micro size drones such as the Tiny Whoop, and we don’t normally use them on bigger drones. CCD and CMOS are two main types of image sensors in FPV cameras, each with unique characteristics and advantages. CCD is an older technology and used to be the go-to image sensor for FPV cameras. Nowadays most new FPV cameras use CMOS and they are constantly getting better. Here is a summary of the pros and cons, for more detail check out this post about the differences of CCD and CMOS. I must say, the best CMOS cameras outperform CCD cameras these days. I am not talking about the $10 crap you can find on Banggood, but the brand name cameras like the Runcam Eagle or Foxeer Falkor. Personally, I don’t think it matters which image sensor you want to choose, as long as you like how the image looks. Make sure to check reviews before buying, see how they perform in different lighting conditions. There are 2 aspect ratio to choose from in FPV cameras, 4:3 and 16:9. Aspect ratio has nothing to do with resolution, it’s just the different screen shape. 4:3 is more square and has the shape of an old CRT TV while 16:9 is longer like a modern computer monitor. One isn’t always better than the other, it all comes down to which ratio your FPV goggles or display supports. If you have a 4:3 camera, but your goggles is 16:9, the image will appear stretched. 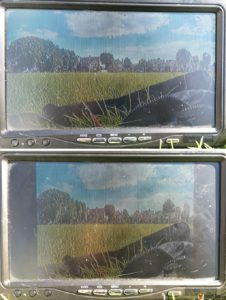 If you have a 16:9 camera but a 4:3 display, the image will appear squashed. Aspect ratio isn’t directly related to the peripheral view, e.g. 16:9 camera doesn’t necessarily give you a wider field of view. It actually depends on the lens and image sensor of your camera, which we will talk about later. But it’s worth knowing that CMOS sensors have a native aspect ratio of 16:9, while that of the CCD is 4:3. Some CMOS cameras allow you to choose between 16:9 and 4:3 in the setting, but the 4:3 is achieved by chopping off the sides from a 16:9 image, and therefore you will get a smaller field of view in 4:3. FPV camera lenses are different in two main things: focal length and thread size. Note that lens focal width DOES NOT equate to FOV. FOV is a result of both lens focal length and sensor size. It’s actually important to know what FOV you personally prefer than knowing the focal width when you are buying a camera, as the sensor size can vary. The wider the FOV, the more environment you can see which is preferred when flying proximity and racing. However when FOV is too large, the image will get more distorted, which is known as the “fish eye” effect. The objects in the middle will appear smaller and further away than it really is, while the edges of the image will appear curved and distorted. I personally find 130-150 degree a good range for FPV, typically 2.1mm – 2.5mm lens. This is a good example of different FOV (from narrower to wider). You can replace the lens on an FPV camera to get a different FOV or image quality. In this article I experimented a few different lenses for the Runcam Swift, you can see how they make a difference to the image. 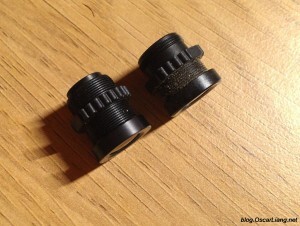 There are two thread sizes in FPV camera lenses: M8 and M12. M12 lenses are bigger but heavier. They are normally used in Mini and Standard size cameras. They let more light in, thus the image quality is usually slightly better than M8 lenses. M8 lenses are very compact and mostly used in Micro and Nano cameras. Check out this article to learn more about FPV camera lenses. Wide Dynamic Range (WDR) is a technology that aims to improve image detail under extreme lighting conditions where both bright and dark areas are present in the same frame. As you can see the image on the left it’s under exposed, you can see the sun and clouds very well, but the tree and bushes are all dark. On the right we have an image that is slightly over exposed, the trees are all visible now but the sky is blown out. The image in the middle represents the best wide dynamic rangeof the three images, you can see the clouds and the trees at the same time. Once you understand the concept you will begin to appreciate the importance of WDR capability in FPV cameras because it helps you see better when flying. Most FPV cameras have some degree of WDR, but the WDR performance can vary. If you plan to fly indoor, at sunset/dawn, or even at night, then you have to find out about the low light performance of an FPV camera. Some are designed more specifically for low light than others. Here is a low light comparison of some popular FPV cameras I did recently. Low light capability of an FPV camera is measured in LUX. The lower it goes the better it is for low light. For example, the Runcam Swift 2 has a minimum LUX value of 0.01, while that of the Runcam Eagle 2 is 0.0001, you know the Eagle 2 is going to be better at low light than the Swift 2. Cameras with bigger imaging sensor also normally perform better in low light as more light enters the sensor. Most FPV cameras come with day/night mode. It enables to the camera to output either color and black and white images based on user’s selection, or lighting condition. “Night mode” makes use of near-IR light to deliver black and white images, allows you to see better in low light. Does it matter which one to use? It does and it doesn’t. The main difference between NTSC and PAL is in resolution and frame rate. PAL offers slightly better resolution, while NTSC allows higher frame rate. If you want to have better picture, go with PAL. But if you want more fluid footage, NTSC does a better job. For a more detail comparison, check out this post. 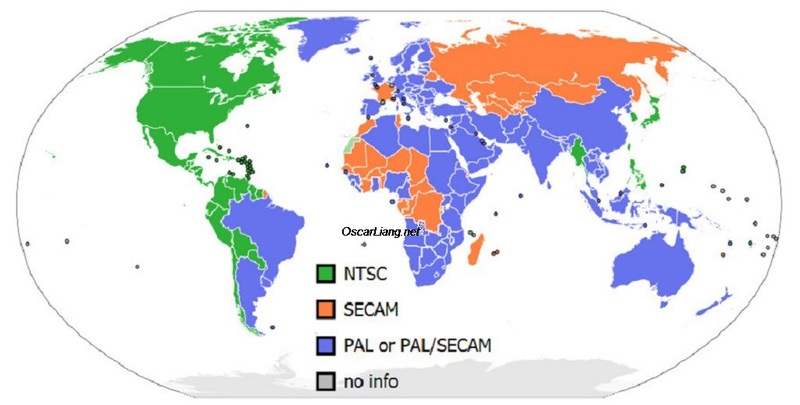 Conventionally, NTSC is used in North America, Japan and South Korea while PAL is used in most of Europe, Australia and large parts of Africa and Asia. It might be a good idea to stick with the standard in your country. But it really doesn’t matter nowadays, because both video formats are supported by all FPV equipment. Note that you have to choose which format your camera is using in Betaflight OSD in order to have the text displayed correctly. TVL (TV Lines) is what manufacturers use to measure analogue FPV camera resolution. The number is based on how many alternating black and white lines can be displayed in the image horizontally. 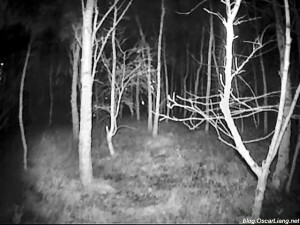 A 600TVL camera means it can display 300 black lines and 300 white lines alternately in one frame. The more TV lines, the better definition image you can get out of the camera. Commonly seen FPV cameras TVL are 600, 700, 800 and 1200. However higher TVL doesn’t always give you better image due to the limitation of analog 5.8Ghz video transmission, as well as your monitor or FPV goggles. For example, 1200TVL is not going to be twice as sharp comparing to 600TVL in an analogue FPV system. There is no easy way to verify the TVL spec claimed by manufacturers. So don’t be overly concerned about this number when buying an FPV camera, and base your decision on the actual image quality. It takes time for the FPV camera to capture and process the image before sending it to the video transmitter. The delay varies from camera to camera depends on its hardware as well as software. Latency can be a deciding factor if you are into drone racing or high speed flying. The lower the latency, the more quickly the pilot can react. Imagine if you are flying at 100Km/h, a delay of 50ms (0.05s) means you quad will travel 1.4m before you can react on the sticks, which could mean the difference if you hit or miss the obstacle. Latency is not something printed on the specifications, so I try my best to test as many cameras as I can, and provide this info to the community: FPV Camera Latency Testing. 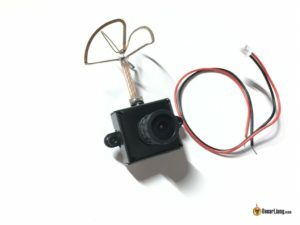 The connection of FPV camera is very simple, there are usually only 3 wires: power, ground and video signal. There might be more connections depend on camera features. Most cameras these days support very wide input voltage, e.g. 5V to 36V. This allows you to power them either from a regulated power source or directly from LiPo batteries (2S-8S). I have some good practices on how to connect your FPV setup to get the cleanest possible video. You can access the camera menu and settings using a controller that comes with the camera. 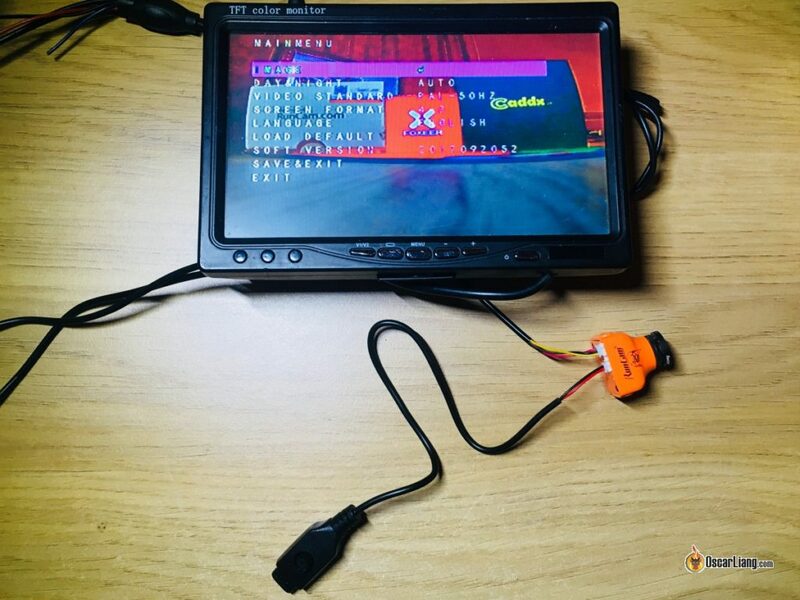 Thanks to the effort by flight controller software developers, we can now even do this from our radio transmitter by hooking up your camera to the flight controller. This means you can change your camera settings anywhere without carrying a controller with you. Here is the tutorial how to set up camera control via OSD pin. Can I use HD cameras as FPV camera? Those HD FPV videos you see on Youtube are captured using HD action cameras like the GoPro or Runcam 3, which is an additional camera pilots put on their multirotors. Some of these HD cameras provide “video out” capability, and you can hook up to a video transmitter for FPV. But the latency is normally too high for FPV flying (typically over 100ms). You will probably crash before you can even see it. Therefore I always use a dedicated FPV camera alongside with a HD recording camera. It’s also important that you don’t put the FPV camera on a gimbal, so it doesn’t mess up your orientation. This is a bit off topic, but i am sure there are beginners wondering what an OSD is. Basically, an OSD (on screen display) is a device that overlays text/data onto your camera footage. OSD is an useful tool to have, you can display different types of data on your FPV screen, such as battery voltage, timer, RSSI, current draw and so on. Most flight controllers these days have built-in OSD so it’s become a lot easier to setup. I hope this tutorial was useful and helped you choose your next FPV camera. Don’t hesitate to leave me comments or questions. Happy flying! Oscarm,, thanks for the write up…. there are so many options I am dizzy…. Thanks for taking the time to provide the information. I have just installed the AIO by the looks of the picture in a rc digger. Chosen because of size. Works ok but I would be interested in a lens that deals with short distance with clarity, ie it’s fitted in the cab and the focus is on the bucket. or the most forward top / bottom portion of it’s wing. the aircraft will do the 360 degrees plus horizontal (yaw) view. This is for personal fun only. I’m a senior RC pilot, life AMA member with safety in mind. I’ve done basic searches for the above items with no results. I need a first person view camera for my drone which is three feet long with a three feet wingspan. The plane weighs less than 15 pounds. Is there any development to a high FPS live feed? Competitive gamers such as myself do indeed benefit greatly from 144hz monitors, so I think it will benefit the FPV community as well. Current FPV cameras are only a max of 30 FPS, which is quite slow if you ask me. The image is just great but not sure if that could be considered HD. It is actually 1000 Lines right? The goggles I have do not support HD, they are actually 600×400 so as you mention on the article, I am loosing some quality there but just got it in case someday I want to upgrade the goggles. Also the camera has a screw there so though I could remove the lens but have not been able to do so.. any idea on how to do it? Excellent info thanks, as this is not a recent article do you have a more up to date one? Keen to see if there are any better newer options, I am looking to upgrade my Wizard X220S with 800TVL to something with a better picture, I like the sound of the Predator in this article. The considerations for FPV camera haven’t changed much, so the info in this post is still very relevant. Sir for On Screen Display can we connect the smart phone to video reciever? If so how can we connect it? Thanks for the tutorial. We are looking for a relatively simple system with long dwell time for monitoring our hunting preserves to preclude poaching. We need real live time feedback and some sort of system that will monitor a wide field of view (largest ground area with reasonable resolution). Any suggestions? A current or near future technical question from a serious amateur still photographer: Are there quadcopter cameras with large image sensors (e.g. “full size” Nikon D5 is 35.9 mm X 23.9 mm)? Are there interchangeable lens or mechanical zoom, not digital zoom? Explanation of the question: The perspective of the quadcopter offers a practical perspective for “art” still shots that otherwise only could be achieved by shooting from full sized helicopter. By being able to more narrowly control the depth of field…I.e. make it more shallow…and be able to capture large image files…i.e. raw files in the 24 mb range, large artistic images would be possible. For example, a shot of a ship at sea needs a deep depth of field but a shot from about 50 ft of a raptor feeding its young in the nest needs only about 2-3 ft in focus. Too great a depth of field in that setting distracts the eye from the subject. You want only an out of focus background that supports but not distracts from the story you are trying to tell with the image. Thank you for this, I have been struggling with questions towards fpv and it’s setup for months now, finally building my second 250quad after losing my first in the woods (still). And now it’s on to finally, ohhh finally, fpv. This blog was really, very well articulated and touched on every topic I had questioned about. You’re the man. In conclusion, I’ve decided on 600tv , probably that Foxeer HS1177 you mentioned, I have it on paste lol my only other question would be… for the transmitter, is 600mw the obvious choice, over 200mw? Also.. is 1.? ?ghz better then 5.8ghz? youtube.com/watch?v=WrjGromqfoE where they guy has used the empty battery space to fit a vtx in the runcam……If you’re not racing, this is adequate and saves space and weight. Hello. Under the section on FOV I think you have a mistake – lenses that come with IR filters make for better daytime visibility, but drastically reduce nighttime visibility. Most cameras have an IR filter. If the camera does not have an IR Filter, you can sometimes see really well at dusk, etc, but risk having “whiteout” during the day. Your information is always very clear and objective. 1) Can you discussion the intracacies of FPV latency? 2) If a camera has a particular actual resolution in pixels (WxH), can we expect this resolution to be accurately conveyed to the 5.8ghz receivers and DVRs? If not, how do we tell what we are actually getting? There is no info of how to find correct aspect ratio camera and googles. I have spent a lot of time to find real camera with 16:9 aspect ratio which corresponds to my FPV googles. I don’t understand why most of the cameras are 4:3 aspect ratio when most of the TV, Monitors, googles are 16:9. Even GoPro outputs 4:3 live video and adds black bars up and down which makes impossible to use with any of 16:9 TV. Thank you very much for this post It really helped thanks. I have viewed the Inspires digital view through Headplay. It was awesome. I want to have that super digital clarity for my 250 racer. So I need a lightweight video transmitter (200 meters is minimum but more is better ) & receiver with no lag and a small high res. digital camera. I understand GoPro has lag which I do not wish to tolerate. Can I have your advice please . Please respond to my email address with a copy of your response when you have time. the reason we fly analogue is because it is tolerant of interference. hd signal is either all or nothing. when signal is weak, you get no image. i don’t know about you, but when signal is weak (ie. due to lots of trees and interference) i’d rather get a really garbled image (and still be able to just barely make out enough to fly out of the woods) than see no image at all (and most definitely crash due to that same interference). Hey thank you for the information. I just wanted to make a quick note. When you said “Some lenses can even improve the camera light sensitivity, and some come with infrared filter which enhance the ability at night.” I think you meant to say that some come “without” the filter which enhance night visibility. Thanks for the post, it’s very helpful. I have a questions regarding FPV cameras and transmitters. You say FPV cameras has at least 3 wires (positive voltage, ground and video). So, is it possible to connect any kind of FPV camera (CCD/CMOS) to any transmitter? 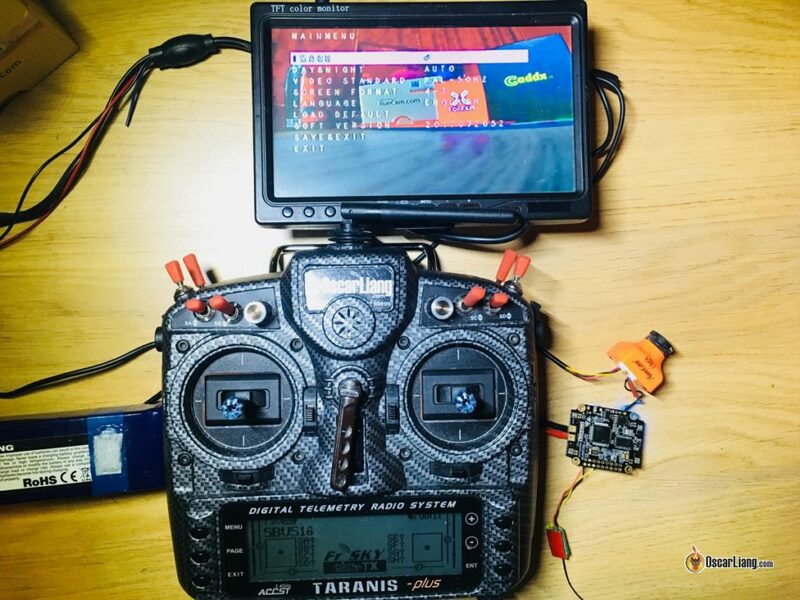 I have a TX5803 transmitter and a DEVO F7 with RX corresponding video receiver (working with an iLook camera), and I want to re-use this kit (TX/RX) for a 250 racing drone by connecting a dedicated FPV camera. It is possible. Any kind of camera can be connected to any kind of transmitter. Were the pictures at Hollywood beach taken with a quadcopter? Nice place to take pics with one. Hey , just a minor point about TVL , it’s actually vertical lines displayed which is equivalent to “horizontal” resolution. The vertical resolution is fixed in the PAL / NTSC analog standard and can’t be changed. TVL is not connected in any way to 576p and 1080i or whatever which is also vertical resolution ( also called lines). That means if you have 600 TVL you might have higher horizontal resolution but the same vertical resolution. Sorry, but i can find only 32×32 or 38×38, can you help me? Hi Luca, sorry i meant 32 and 38, not 25. I have updated the post now. but you can find smaller camera, try searching for Sony 600TVL Mini. Great …thanks for this article! Nice article, very helpful. There is so much more to this hobby than “grab & go fly” and you lay it out in an easy to read and understand form. It seems every article I read leads me to 2 or 3 more I am going to need to read, I like how you refer to the more detailed stuff but break it down to beginner/advanced. Was about to buy a new Sony 800TVL camera but luckily I found a video on Youtube where they found out about the excessive lag compared to the Sony 600TVL PZ0420. Anyone know of a new generation camera with low lag or comparable to the Sony 600TVL PZ0420. Hi Oscar ..this is a very fine article on selection of a camera..i need a suggestion from you .i am designing a vision added inertial nevigation for quadcopter ..so which cmos camera would you prefer me for this application. Arduino Yun – Arduino on the Cloud Raspberry Pi’s Competitor?